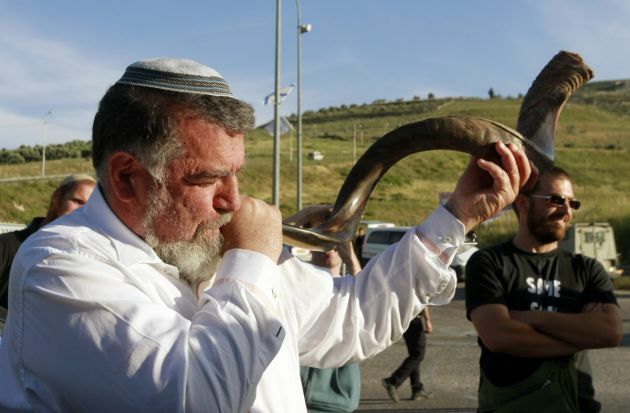 (Photo: REUTERS / Abed Omar Qusini)A Jewish man blows a shofar, a ram's horn, during a protest by Israeli army reservists against the "price tag" attacks carried out by Israeli settler groups, at the entrance of the Yitzhar Jewish settlement near the West Bank city of Nablus May 18, 2014. Dozens of Israeli army reservists gathered outside the Yitzhar Jewish settlement in the northern West Bank to take part in the protest. "Price tag" refers to the retribution the settlers say they will exact for any attempt by the Israeli government to curb settlement in the West Bank, an area Palestinians seek as part of a future State. Water not oil is the resource for which many people in the Middle East have a thirst, especially in the Holy Land. "The Palestinian people thirst for water justice," said a recently issued statement by a group that recently visited Jerusalem, the West Bank, and Gaza to better understand the critical issues of water and sanitation in Palestine. "The Palestinian people are denied their internationally recognized human right to sufficient safe, accessible, and affordable water and adequate appropriate sanitation," the statement by the Ecumenical Water Network on Wednesday says. The fact-finding group had 10 members of the international reference group of the Ecumenical Water Network (EWN), supported by churches and Christian organizations promoting people's access to water around the world, said the statement released by the World Council of Churches. The group spent nearly 10 days in the area, interacting with Israeli and Palestinian leaders, non-governmental organizations, and church leaders." The water network is a global initiative of the Geneva-based WCC. The EWN programme executive, Dinesh Suna said, "The trip was an eye-opener for me. Never had I seen this glaring a level of disparity over water." "The problem is not scarcity as such," he said. "Though an arid area, Israel and Palestine both receive enough precipitation. "Ramallah gets more rain per year than London. But an average Palestinian there gets only 70 litres water per day, while the average Londoner gets around 150 litres per day, and the average Israeli over 300 litres per day." The statement refers to the lack of clean water and adequate sanitation in the West Bank and Gaza. It notes the steep challenges facing Palestinian residents and farmers. Among other factors, it cites Israeli control over access to water in the West Bank, acquisition of precious aquifers by Israeli settlers. This takes place in a complex and discouraging legal framework. It includes prohibitions against Palestinian use of well water to raise crops and animals, and prohibitions against West Bank residents building essential new water supply and wastewater treatment plants. "In Gaza," the statement says, "the situation is even direr," with microbial contamination of 80 percent of drinking water, 95 percent of groundwater rendered unusable by the intrusion of sea water, contaminated aquifers, and inadequate desalinization facilities.